One of the issues that many blockchain startups and institutional investors face centers around obtaining liquidity. Today, initial coin offerings (ICOs) are a standardized form of capital raising among blockchain startups and beyond. Within the past couple of years however, the ICO model has significantly improved. Consequently, we’ve seen significant attention paid to the field of compliance, in addition to improvements in KYC/AML regulations during funding events. One of the issues that many blockchain startups and institutional investors face centers around obtaining liquidity. Universally, cryptocurrencies are rarely recognized as an item on the balance sheet, which would actually be useful for a startup or institutional investor when obtaining credit lines from retail or private banks. From a startup or investor’s perspective, the aforementioned treatment poses some issues. For example, a blockchain startup may have liquid Ethereum or other cryptocurrencies, and own native tokens in their balance sheet. Even with the current volatility of cryptocurrencies in general, there are opportunities for banks to actually value these assets to a certain extent and grant cash loans to startups and/or investors in order to improve the liquidity of that startup. Such cash loans might help the startup or an institutional investor to obtain the exposure on that particular digital asset (whether Bitcoin, Ethereum or Token) and receive affordable financing to cover operational costs such as salaries and any other burn rate expenses. In certain cases, it would be an even loss if the investor had to close a Bitcoin position in a bear market. In such cases, sudden finance needs could be covered by a cash loan against cryptocurrency assets and that could then be used to finance the operational costs for managing assets. For a while now, we’ve seen more institutional and blockchain startup usage on our digital asset-backed lending platform ETHLend. Cryptocurrency holders and startups are looking for finance channels where such assets are recognized. In ETHLend’s case, the marketplace is peer-to-peer, which means that there are lenders who are more open to finance against cryptocurrencies with a certain loan-to-value ratio. 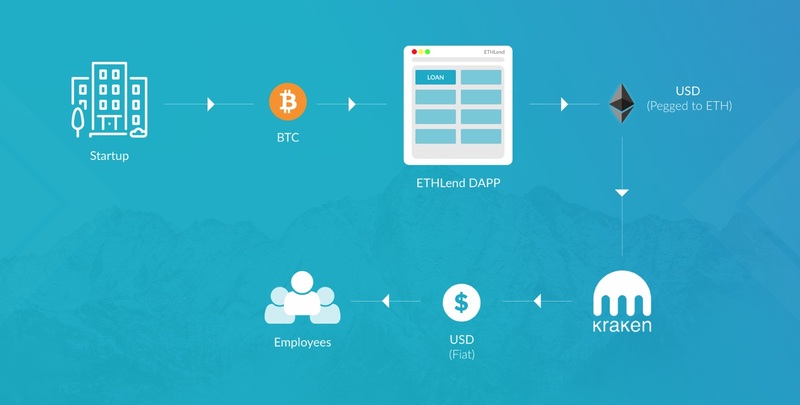 ETHLend’s model is quite simple. A borrower comes and pledges tokens (these might be tokens reserved for the founders or for the startup itself deriving from the Initial Coin Offering) and asks for an USD valued ETH loan (or EUR). Then the borrower agrees to return the exact same amount of USD (with interest) that he/she originally borrowed in the form of ETH. Next, the borrower goes to the preferred exchange and converts the ETH to USD and cashes out for spending. The length of the loan may last for a year and be paid monthly. During repayments, the borrower uses USD income or funds. Finally, the borrower sends the USD to the exchange, converts to ETH and repays an installment. We are actually solving two things here. We are creating a way to borrow and lend with the use of smart contracts. That way, if ETHLend’s platform, for some reason, was no longer functional, the parties would be able to access the loan and continue to interact since the logic remains on the blockchain. This type of system is very secure — much more secure than trusting a third party with your cryptocurrency. It’s also more secure than storing your funds on an exchange, which might not be secure enough for institutional investors. We are also able to provide a market where USD or EUR (and soon other currencies) can be borrowed in the form of ETH without the risk of volatility for the borrower. Thus, we have a scalable decentralized model for receiving USD or EUR value from a global liquidity market. Due to low loan-to-value ratios along with the possibility of supplying collateral in the case that the collateral asset decreases, there is less liquidity risk for the lender as well. More importantly, we are able to recognize the business model of a cryptocurrency investor or blockchain startup and assist these borrowers in gathering financing so that they can grow. Follow our progress and ask your team whether digital asset-backed lending would be the preferable financing model for your project. But not here in the U.S.A. Prison bound?